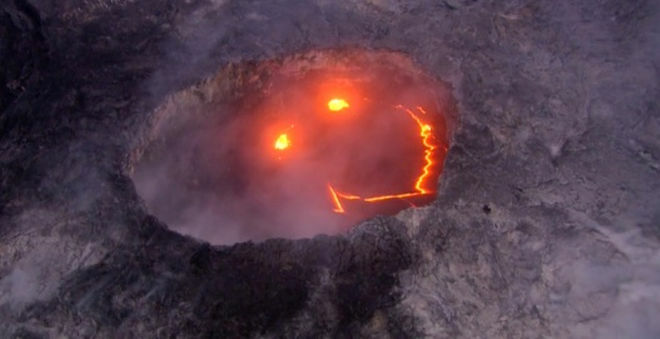 A “smiling” volcano has gone viral. Hawaii’s Kilauea volcano has been actively erupting since 1983, and it’s one of the most active volcanoes in the world, according to the U.S. Geological Survey (USGS). But the volcano received more attention recently when the volcano’s lava formed what looks like a smiley face. Pu’u ‘O’o also recently made headlines when the lava flow reached the ocean for the first time in three years. While it may seem like Kilauea was smiling for the cameras, the “face” has a more scientific explanation: The bright spots and incandescent line that created the face shape were produced by normal volcanic activity. As a lava lake circulates, lava upwelling and downwelling will occur on opposite sides of the lake, according to the Hawaiian Volcano Observatory. This often results in a spattering of molten lava, which creates bright spots on the dark-colored, semi-solid lake surface. Circulation can also cause sections of the surface to pull apart, revealing the lava beneath and creating lines. By chance, these processes occurred in a pattern that created the smiling image, Babb said. “The Pu’u ‘O’o lava lake just happened to produce two spattering sources (bright dots) that have been interpreted as ‘eyes’ and an incandescent line that has been interpreted as a ‘mouth’ — with the two lake surface features located relative to each other to produce the iconic symbol of a smiley face,” Babb told Live Science.